5 Player Number: Place your player number token here. Player number is used in conjunction with the turn order deck to determine turn order. 6 Life: Place your life tokens here. 7 Ability: Each breach mage has a unique ability. The player mat explains when that ability can be activated and what it does. Abilities can only be activated when you have a charge token on all of the spaces shown below the ability. Once an ability is activated, all of the charge tokens are removed. 8 Deck: Place your deck facedown here. 9 Discard: Place your discard pile faceup here. 10 Breach Mage Story: Has no effect on play. Provides further lore into the world of Aeon's End. 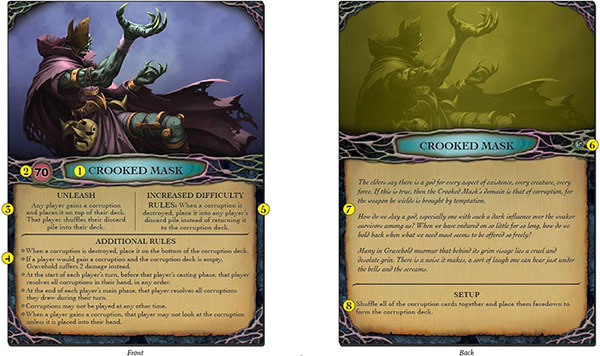 Breaches are double-sided cards used to prep and cast spells. A single spell may be prepped by placing a spell card from hand to an opened breach during a player's turn. On a subsequent turn, a player's prepped spells may be cast by discarding the spell card. 1 Open/Closed: One side of the card is used to indicate that the breach is open, the other indicates a closed breach. 2 Breach Number: Used primarily during setup to indicate where each breach placed next to the player mat. 3 Open Cost: The cost, in aether ( ), to open the breach. When a breach is opened, flip it to the opened side. Once a breach is opened, it remains opened for the rest of the game. 4 Focus Cost: The cost, in aether ( ), to focus the breach. When a breach is focused, rotate the breach card 90° clockwise. 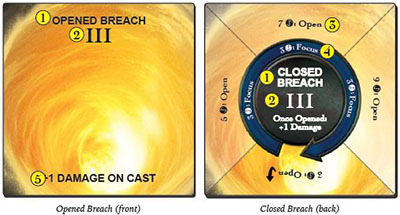 The only time that spells can be prepped to a closed breach is during the player's turn in which that breach was focused. You may open or focus breaches in any order. For example, you may focus Breach III before Breach II, or open Breach IV before opening breach II or III. 5 Opened Effect: Some breaches have effects that occur whenever a spell is cast from that breach while it is opened. Some spells may refer to adjacent breaches. Breaches are always adjacent to the one or two directly next to them physically. For example, I is adjacent to II. II is adjacent to I and III. 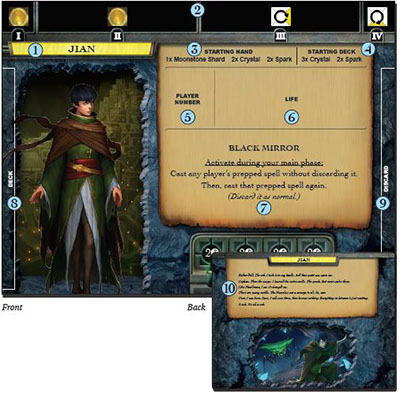 Player cards are the various cards the players can use to build their decks in order to defeat the nemesis. Each player starts with a unique hand and deck of cards. Players will acquire more cards for their deck by spending aether ( ) to gain them from the supply piles. 2 Type: There are three types of player cards: gems, relics, and spells. 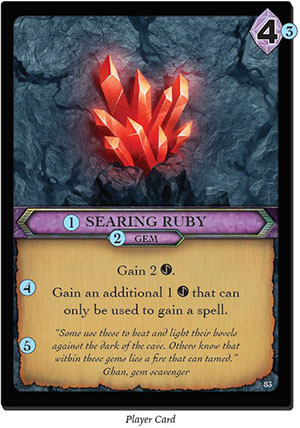 Gems are played to give you aether ( ), the main currency of the game. Aether can be spent to gain more cards, gain charges for breach mage abilities, and focus breaches. (Breaches are the conduits through which spells are cast). Spells are the main way of dealing damage to the nemesis and his minions. Spells must be prepped to a breach (that is, the spell card must be placed on a breach card next to your player mat) before you can cast them. Relics have a variety of useful instantaneous effects. 3 Cost: The amount of aether ( ) you must spend to gain this card. 4 Effect: The effect you resolve when you play the card. Gems and relics have effects that are resolved immediately. Spells need to be prepped to a breach before they can be Cast. 5 Flavor Text: Has no effect on play. 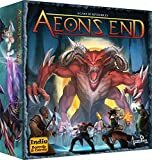 Provides further lore into the world of Aeon's End. 6 For each player card there is one additional copy that has a grey border. 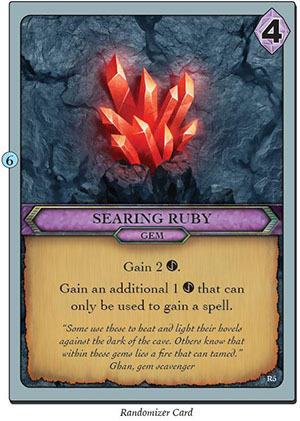 The grey-bordered cards are used during setup to randomly pick which gems, spells, and relics will be in the supply. These cards are not played with during the game. 2 Life: Starting life of the nemesis. The nemesis's life is tracked on its life dial. If the life of the nemesis reaches zero, the players win. 3 Unleash Effect: The effect that occurs when the Unleash keyword resolves. Each nemesis has a unique Unleash ability. 4 Additional Rules: Any additional rules that pertain only to this nemesis. 5 Increased Difficulty: An optional rule which can be used to adjust difficulty. 7 Nemesis Story: Has no effect on play. 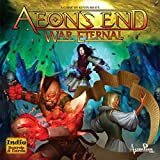 Provides further lore into the world of Aeon's End. 8 Setup: Additional information required during setup for this nemesis. Nemesis cards are the attacks, minions, and powers the nemesis uses against the players and Gravehold. The nemesis deck is constructed at the beginning of each game from a mixture of basic nemesis cards that can be used in any nemesis deck, and a number of unique cards that are only used with that particular nemesis. You may encounter the same nemesis many times, but it will never attack you in exactly the same way twice. 2 Type: There are three types of nemesis cards: attacks, minions, and powers. Attacks are resolved immediately and are then discarded. Minions: Minions enter play with life tokens and stay in play until defeated. They have persistent effects which are resolved during the nemesis's main ph ase. If the life of a minion reaches zero, it is immediately discarded. Powers: All power cards have "POWER X:" on them. When a power card enters play, place X power tokens on it. Unless discarded, power cards stay in play for X nemesis turns before resolving. During the nemesis main phase, remove one power token from every power card in play. When a power card has no tokens left, resolve its effect and then discard it. 3 Life: Minion cards have life which can be depleted by dealing it damage. If the life of a minion reaches zero, it is immediately placed in the nemesis discard pile. 4 Effect: The effect to resolve for this nemesis card. 5 To discard effect: Some power cards have a "TO DISCARD:" effect. During any player's main phase, that player may fully resolve the effect listed to discard that power card. If a power card is discarded this way, its effect will not be resolved. 6 Flavor Text: Has no effect on play. Provides further lore into the @ world of Aeon's End. 7 Nemesis: The nemesis to which the card belongs. Cards that say "Basic" may be used with any nemesis. 8 Tier: There are three tiers of nemesis cards. Tier 1 cards are less dangerous than Tier 2 cards, which are less dangerous than Tier 3 cards. Some unique nemesis cards are marked as Tier 0. These cards are covered in the additional rules section of the nemesis to which they belong.